Delicious twist on popular sesame asian noodle salad…revamped!As always, this Rotten Recipe Revamp is low fat, reduced carb, gluten free and contains no refined sugar, so you can piggishly snarf it up without the guilt that follows eating a large bowl of pasta. 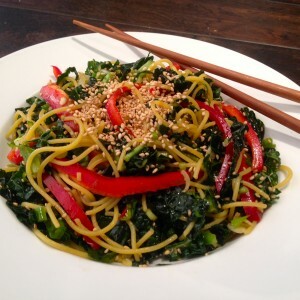 We’ve replaced the bulk of traditional glutenous noodles with a small amount of gluten free pasta, a bushel of kale and a red bell pepper, both thinly sliced and swirled with noodles to emulate the texture in our traditional noodle salad. Good trade: Kale and red pepper are two of the most nutrient-dense vegetables on the planet. Between the two, you’ll get 100% of your daily recommended immunity-defending Vitamin C. Plus, a strong start to your DRV for vision-improving Vitamin A, anti inflammatory, cell repair and brain-boosting Vitamins E and K, metabolism-motivating folate, energy-enhancing iron, satiety-inducing fiber…an antioxidant bounty…in addition to anti-cancer causing sulfur compounds thought only sourced from cruciferous veggies like broccoli! Hands down one of the tastiest, simplest and most natural ways to soften kale – no heat involved, thus no nutrient loss. Instead, let your sauce do the work! Since kale, unlike typical greens, is sturdy enough to withstand the dip in our acidic dressing, you can make this ahead of time and enjoy over 2-3 days during which the flavor will continue to deepen into UMAMI-town! (In this case, it’s the onions that are likely to get funky). KALE HATERS CONVERT. You know kale is terrific for you, but can’t get past the rough texture and bitterness? Try this salad. Gonna make a believer outta you! Place finely sliced kale, red pepper & green onions into biggest salad bowl you own. In small bowl mix together sesame oil, soy sauce (or Bragg’s), rice vinegar & honey. Pour mixture over that giant bowl of veggies and toss thoroughly and set aside. (Let the acidic dressing soften the kale while you prepare pasta). Fill large pot with lightly salted water and bring to a rolling boil over high heat. Once the water is boiling, stir in the gluten free pasta, and return to a boil. Prepare large bowl of ice water. Cook pasta uncovered, stirring occasionally, until pasta is al dente (cooked through, but still firm). Use a colander to drain and immediately toss pasta in bowl of ice water. Allow pasta to “chill” for 5 minutes. Stir occasionally to break up any clumps. Finally, pour water through colander and toss pasta with veggies until well coated. Top with toasted sesame seeds & cilantro. Cover and refrigerate. Serve when ready with lean protein such as seared ahi or stay vegetarian by tossing garbanzos into the mix. Serves 4. (2 if you’re a complete snout like Byron and me).